Map scale description: 3" 1/4 : 1 Stat. Mile. This French map is coloured to distinguish land use. Open land is green and the built- up area of the city is pink and red. Blackfriars Bridge, under construction at the time this map was produced, is shown along with its proposed approaches. 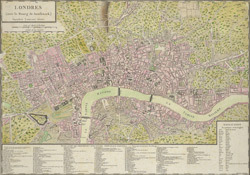 The intended canals from St Marylebone to Moorfields and to Waltham Abbey are also shown. An English-to-French translation table of topographical words is included. The border is marked off in toises (a French measurement of roughly six feet).